Patients looking for a less extensive option to enhance the aesthetics of their smiles find veneers a great option for their needs. At Pacific Dental Associates in San Francisco, we provide cosmetic dental veneers for patients who have chipped, stained, or slightly crooked teeth. Porcelain veneers restore the look and feel of your smile. Our dentists focus on providing conservative, effective dental care that enhances the appearance of your smile. Dental veneers are used to improve your smile by covering flaws and creating balanced, whiter teeth. For patients with stained teeth due to tetracycline or smoking, or deep-set stains that teeth whitening can’t remove, veneers cover these issues easily. Patients who have teeth that are chipped or cracked can find that with veneers, their smiles looks uniform and flawless. Veneers generally last between 5 to 10 years, and require no special care. We encourage our patients to continue to follow a proactive oral hygiene routine at home which include brushing, flossing, and rinsing with antiseptic mouth wash. The color and shape of the veneers are crafted by our San Francisco dentists who do their best to ensure they seamlessly match the rest of your smile. At Pacific Dental Associates, we provide porcelain-zirconia veneers for patients looking to enhance the aesthetics of their smile. Zirconia veneers are known for their strength and opacity, being ideal for patients with intrinsic stains that teeth whitening cannot treat. 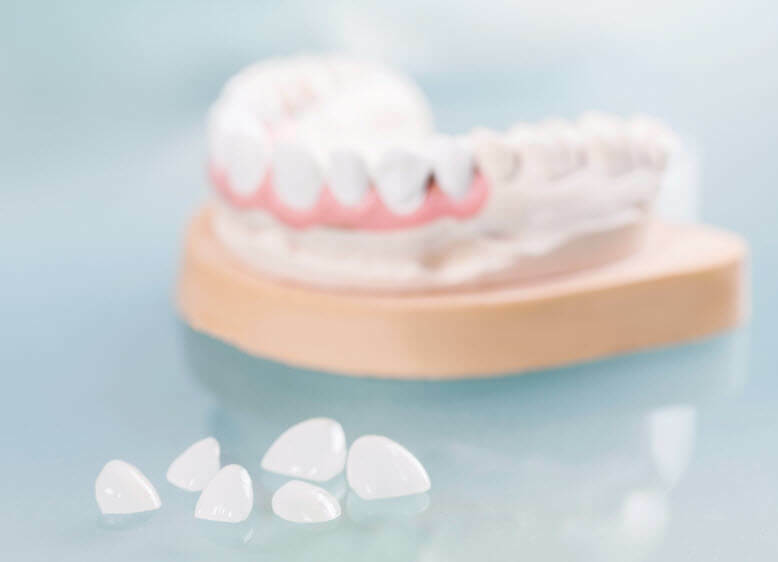 By its ability to mask a number of issues, zirconia veneers, or porcelain veneers, are resistant to fracture and --- as they are tooth colored --- blend in with the rest of your smile. Dental veneers require minor alteration to dental enamel, to make the restoration as natural looking as possible. Our Pacific Heights dentists and staff go over questions about the procedure, how long it takes, and incorporate your smile goals and needs into every treatment plan. We develop a wax-up of the veneers to show a physical representation of your future smile. The preparation for the veneer is done the same day as the mock-up. We place a temporary in place until your last appointment, where we cement the final restoration. In order for veneers to create an even appearance, a fraction of your enamel is removed to fit the veneers in place. We often tell patients that, in order for the rest of their smile to match the brightness of their veneers, teeth whitening is recommended prior to the procedure. This way, we can achieve the best outcome and improve your overall smile! Our San Francisco dentists are focused on providing a multi-disciplinary approach to dental treatments. We want our patients to have healthy, beautiful smiles. For more information about veneers, or other porcelain restorations, contact Pacific Dental Associates at their San Francisco dental office in Pacific Heights to schedule an appointment!